Pluto Signs are connected to transformation and life challenges. Pluto's energy is subtle, yet strong. The results may slam you against the wall. While Pluto doesn't wrap it all up in a nice neat package, things happen when this planet is around. Its motto is "out with the old and in with the new. Pluto is all about secret and undercover information. When it all comes to light, your world is changed. It is often considered to rule the masses more than the individual. Pluto may bring an end to things that need to be let go of. This could be a job, a relationship or anything else that is dragging you down. It may not be easy to do, but you need to pick up the pieces and go on with your life. The psyche can't hold on to everything and remain healthy. While it is scary to let things go, it will be better in the long run. 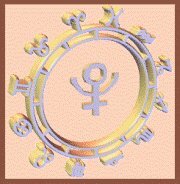 Pluto Signs also deal with social and personal power and powerlessness. Old hurts can build up, leaving us feeling powerless and victimized. This is Pluto at work. It attempts to compensate and pushes us to re-evaluate painful events and feelings. Once we do, we can attain a higher level of enlightenment and happiness. A good example of Pluto in action would be the book The Secret. It has a Pluto name for starters, and this tiny book literally transformed the masses. If we as individuals heed the books significance, we will undeniably empower our personal lives. An interesting point to note is the fact that Pluto was in Sagittarius when the book was first published; and of course Sagittarius rules over publishing. The message of your Pluto Sign is Self Empowerment. Look inward and examine what is there. Pluto will continue to push your buttons until you examine yourself and deal with what you find. It wants you to evolve and become more than what you are.